This is a wonderful snack with cauliflower . Adding yoghurt and lemon makes it tasty and tangy :-). 2 tsp. of All purpose flour. Wash and clean the cauliflower florets. In a vessel , along with the florets, mix all the ingredients required for marinating.Keep it aside for 2 hrs. At the time frying, add the flour along with the curry leaves and mix them well. Heat oil in a pan, deep fry them until they turn crispy.Drain them in kitchen town to remove excess oil. Lovely crispy fitters...nice clicks too. Marinating the gobi and then coating with this maida is very good idea...must be really crispy and spicy, loved that you added curry leaves too.. I love this dish. Your preparation looks awesome dear. 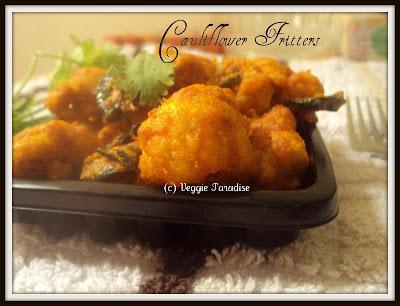 Love the idea of adding curry leaves to the fritters! Fritters look very tempting! Crispy fritters..beautiful picture as usual..
Gobi fritters looks awesome...crispy n yummy! Looks so good. Yumm.Marinating the gobhi is a good idea. Wonderful fritters and great pics !!! Did not know that yoghurt makes it crunchier. Very nicely turned out fritters. 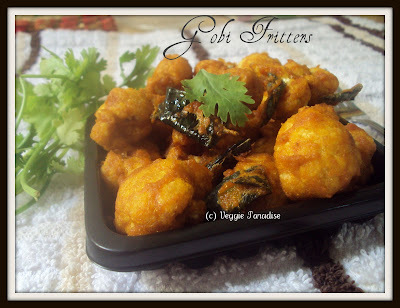 Crispy fritters makes me hungry..awesome appetiziers..
crunchy fritters, perfect on a cold day. the fritter skin looks so crisp! perfect with tomato sauce! Lovely recipe, looks so tempting and delicious. Oh ur gobi fritters look damn good! Tempting snack for rainy evenings! Oh Wow Love these Gobi Pakodas/fritters. Never thought abt marinating them before frying. Excellent idea and I'm sure they taste just so delicious..hot and crispy.. I love the color and the crisp look...am sure it is equally delicious! Wow Aruna the fritters looks very yummy.It came out perfect. Gobi fritters looks lovely ! no chance,very well done.thanks for sharing.